The third Furniture & Interior Industry Summit took place on the 19th – 20th October 2017 in Shanghai, China. 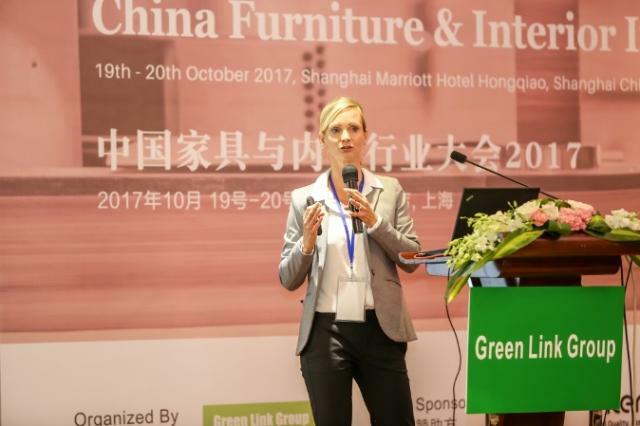 Sylvia Weichenberger, CSIL Partner and Senior Expert, attended the event as a speaker presenting CSIL’s World Furniture Outlook with focus on the APAC region. In her contribution, when she illustrated the results of CSIL analysis in the furniture sector, she pointed out the main competitive advantages of Asian furniture industry as well as the main sector’s challenges namely: productivity, access to labour and labour cost, raw material endowment and the need of design in furniture marking. The summit was an opportunity for the industry to meet and exchange about policy, markets, business strategies, technical perspectives, brands, material and manufacturing as well as opportunities and latest challenges. The summit saw the presence of around 100 industry representatives including technology and components providers and medium upper range European and North American furniture manufacturers as well as major European retailers attended the summit.